Be careful on icy surfaces! There are few feelings as bad as your feet slipping out from under you on an icy surface. You know you’re going down and you know it’s going to hurt. Thankfully, there are things you can do to remedy those slick conditions, and if fact you have to do them. If someone were to slip on your property, you’d be liable. So for everyone’s safety, you need to do something to keep the walkways clear of ice. Rock salt is the primary deicer most people and businesses keep on hand for snow and iceremoval. It works by lowering the freezing point of water so thatthe ice that is there melts. It can also prevent new ice from forming when asurface is pretreated. It is fairly inexpensive and you can buy it in moststores. Excessive use of salt can damage your plants, your lawn, and even your hardscapingand it only works in a certain temperature range. When it is used excessively,like in a coastal city, all of the salty runoff can unbalance the ecosystem. Itcan also injure animals that walk on it, especially the pads of their feet. There are some commercially available, salt-free, pet-safe deicing products on the market. These tend to be less harmful to pets and less rough on their pads. They still provide an ice melting effect, though it is often slower and less effective than rock salt, but in the meantime the product does provide traction. These products also tend to be safer for plants and your lawn. However, it is often a much more expensive option than rock salt. 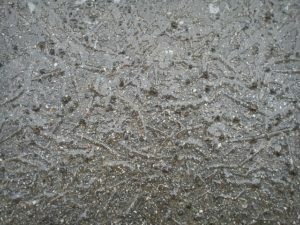 Sand will not melt the ice and it will not prevent new ice from forming. The benefit of sand is that it provides traction on the slick ice surface so that your shoes or tires can get a grip. Sand is safe for the environment and for animals, and it works at any temperature. However, it needs to be reapplied regularly as new ice forms, and you will have some cleanup after the fact since it doesn’t dissolve. If you don’t have sand available, there are other DIY options for getting some traction on the icy surfaces: dry coffee grounds, birdseed, kitty litter, and fireplace ash. Like sand, these will only provide traction and will not actually melt the ice. Theyare fairly easy to come by, however, and you may already have them in thehouse. Ready to start planning your new professional landscape design? Give us a call at 410-849-5119 or send us an email to schedule your free no-obligation estimate today! Don’t forget to follow us on Facebook, Twitter, Google+, Houzz,and Youtube! This entry was posted on Friday, January 25th, 2019 at 6:38 pm. Both comments and pings are currently closed.